We are so smitten with this design! This Save the Date Card just screams vintage carnival to me. This card, custom printed on Quartz cardstock in Azalea and Cobalt ink, can be printed in your choice of colors. Add a custom Envelope Liner (ask our printing dpt. 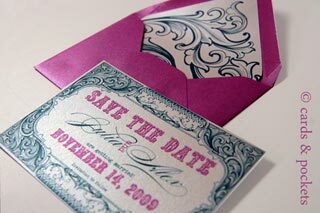 about your own custom Envelope Liners at printshop@cardsandpockets.com) to our A2 sized envelope and voila! A dainty little set that packs a whole lot of punch. Envelope liner: Custom printed by the Cards & Pockets print shop. Hi Amanda! Just email the printing department (printing@cardsandpockets.com) and let them know which style from the Blog you like, they can customize anything for you and give you a quote! Can I get my wedding invitations in this same stye? Please contact our print shop at printing@cardsandpockets.com. They will be able to help you with a custom design setup. Thanks for Posting!